Cigarettes and cigarette lighters have been a part of American and world culture for decades. So it is understandable that something this big to society would produce some rather unique and weird creations. These lighters are not ones that you are likely to see every day and they are certain to make you look twice. This lighter is one that is currently not available in the US and Europe. Why? Well that’s because it is an actual cellphone! Personally I am not sure I would want a cigarette lighter as part of my phone, but at the same time it seems like a really cool parlor trick. But this is currently only available in areas where cigarette smoking is more accepted so many of you might just have to find another cigarette lighter to light your fire. Just in case you really don’t want to give up your matches this lighter is a great compromise. It looks like the classic match and yet works like a normal lighter. The flame even comes out at the red bulb so you get the full match experience without any of the struggle of trying to get a match to light perfectly. I love how creative this lighter it and I think that it is not as gimmicky as other lighters that I have seen. I’m not sure if having a lighter that makes you hungry is the best idea in the world but this one definitely makes me smile. I also like the fact that it looks like a normal novelty keychain so you can really surprise people when you suddenly use it as a lighter. Though you might have to worry about where you leave it because someone might want to take a bite out of it. Rubber Ducky you’re the one! You make bathtime so much fun! Well this ducky is only fun in the tub if you like to smoke in the bathtub. What disturbs me about this lighter is that it is too cute to be a lighter and I could just see some kid wanting to play with it and getting a nasty surprise. But if you are looking for lighter that is just a little different and will attract some “awwws” then this is definitely the lighter for you. Though don’t expect to look too macho while using it. I’m not quite sure what the draw was or the reasoning behind this lamp novelty lighter. I admit it is a little unique and quite funny to look at. But I cannot imagine anyone seriously putting this to any sort of realistic use. Could you imagine getting ready to lit a cigarette and you pull out a miniature lamp and then pull the chain and light your cigarette? Even if your friends were sober that would cause them to burst out laughing. Luckily though this lighter has been recalled so if are unfortunate enough to have it, they want it back. This is a lighter that really makes me laugh and at the same time makes me think that only certain types of people would actually use a lighter like this. Though the look of this lighter isn’t all that makes it truly unique. It talks! Don’t ask me what it says because I have no idea, the description only says that it talks when used. But wait! That’s not all, instead of a traditional orange flame this lighter creates a red flame! So it’s unique in more ways than one but don’t expect anyone to view you as a classy person if you pull this out of your pocket. Say Cheese! Oh wait nevermind. This camera does not actually take pictures but it does light up and for a novelty lighter, it has a surprising amount of detail. Again I’m not sure that this lighter is going to come into any practical use but then no one ever expects novelty lighters to get regular use. This one though, would be great for photographers because it shows just how dedicated they can be to their craft, they can’t even light a cigarette without a camera in their hand. Now I know that toilet humor really appeals to a wide range of people but I got to think that this one goes just a little too far. After all who can really say that they like the idea of a sparkly red toilet? Not to mention the idea of flames coming out of the toilet should be enough to give anyone nightmares. But I will say that this is one lighter that will turn heads and might even cause a few people to have a potty mouth. I would also imagine that if Peter Griffin ever needed a lighter, this might be the one that he would choose. If you like to be just a little old-fashioned this might be the lighter for you. Styled after the old rotary phones this lighter is very unique and you might have a hard time figuring out how to make this lighter look cool. I would also wonder just how easy it is to use because it doesn’t look all that simple, or at least as user friendly as some of the other ones on this list. Now instead of putting out fires, this fire extinguisher creates them. Which honestly I think is way cooler and much more fun. Though not as effective if you are trying to put out a fire. 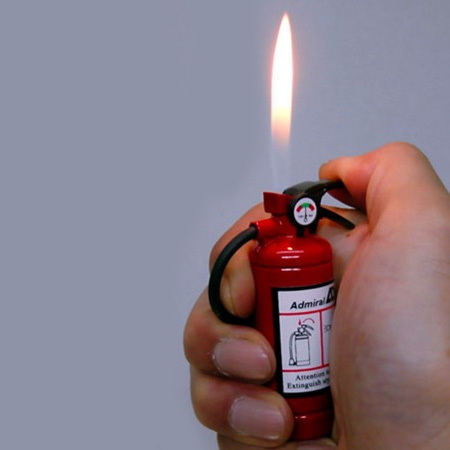 This miniature fire extinguisher is a unique and easy to use lighter, and it is one of the few lighters that I could honestly see someone using on a daily basis. Mainly because it would really make me smile every time I saw it. Now all of these novelty lighters are all in good fun. But apparently the US government does not think so. Apparently there are not enough interesting things for them to concern themselves with, that they have decided to try and ban novelty lighters. The reason? Because children are lightly to view them as toys and get hurt. As ridiculous as that sounds it is. So Americans, enjoy them while you can, everyone else…keep creating these crazy things.